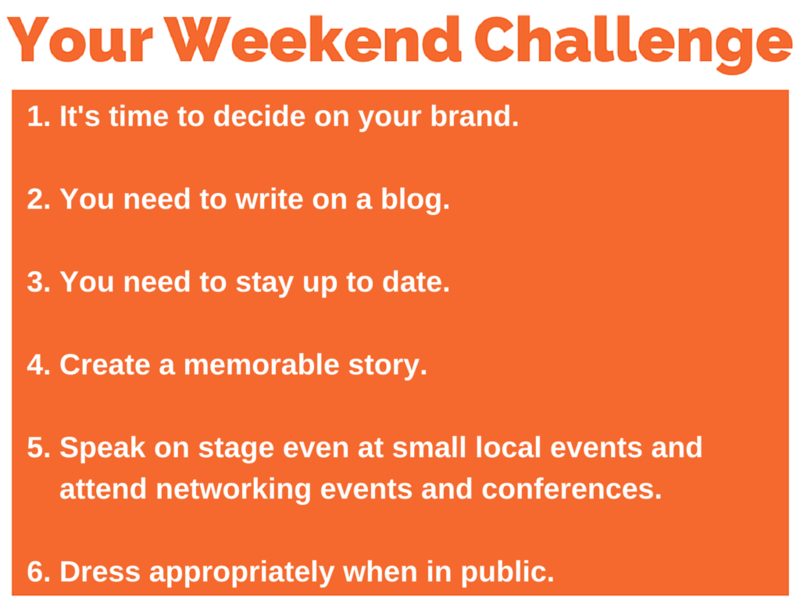 Every single Friday during the podcast, I offer up a Weekend Challenge to help you move further in your business. If you go to this page you will find all of our previous challenges all in one place. 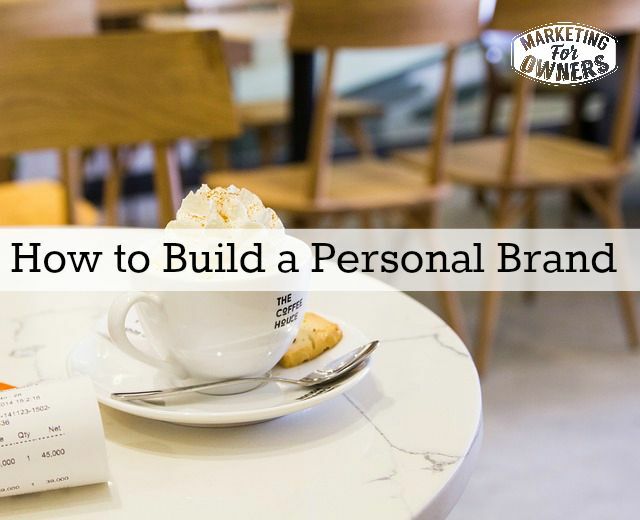 Today we are going to talk about how to build your personal brand. Now, I’ve mentioned before as you know because you’ve been listening, I’m not a big fan of brand in the term branding like you think, in like Coca Cola, Nike, etc..
It’s not that I’m not a fan, it’s just that their branding is for them, not for us. We can’t do that kind of branding. So when I talk about branding, I’m talking on our level, branding for the rest of us. But we can still do it. Now, branding is how we want to be perceived. We decide on our brand, whether it’s personal or for the business, we decide we don’t want our customers or the public to decide for us. We want to tell them what our brand is about and we want to make sure that messaging is true, consistent, and consistent; or it also helps if it’s consistent. Yeah, you get me. Alright, let’s grab our pen and our paper and get started shall we? #1: It’s time to decide on your brand: Now, the way you do that is, quite simply, you decide what you do for people and what problems that you solve. You are not a painter and decorator. You solve somebody’s problems. What problems do they have that makes them require a painter/decorator? Yes. Now, it’s got you thinking, hasn’t it? You have to think what problems you solve. That’s what people have. You need to think of this from a perspective of your customer or your potential customer, okay? It’s a little bit more than just what you appear to do. So if you are a carpenter or sheet metal worker or something like that, that as a bit ordinary. There’s lot of those your brand needs to stand you out differently from everybody else. #2: You need to write on a blog: Now, over this week I’ve been talking about blogging or having a website, keeping it live, keeping it consistent. You need to be writing. You need to have yourself or somebody else write for you, but you need to be giving out information that needs to be controlled by you in the format you decide in your brand –speaking your brand name, speaking your message, giving the information that you know about for your public. It needs to be somewhere you control, this is your website. But you also need to use social media, some of them, not all of them. 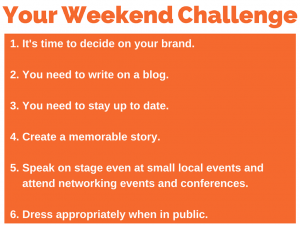 You need to– as well as writing on the blog– you need to schedule time for social media. #3: You need to keep up to date Yes! Things change. Not only do you need to keep up to date with marketing and media, you need to keep up to date with your business, your trade, what’s going on, what’s new, what’s happening, who’s not doing it right, who’s doing it great, what’s coming, etc. Everything advances over time. About 20,000 years ago or something, cars consisted of a wheel, they’ve advanced. You got to keep up. Bad example, probably, but hey who’s counting? #4: Create a memorable story Again, people like stories. Storytelling is– Advertising through storytelling is going to be passed on with word of mouth. It’s easy. Nobody is going to say, “Oh, Joe, the painter and decorator is great!” But if Joe, the painter and decorator, has a story about how he came about, how he got to that point, you might think, “Huh, boring!” Well, you don’t need to embellish. You don’t need to make everything up. Everybody has got a story. Find that story and tell it consistently. People remember the story then they’ll remember who you are. Yes. #5 Speak on stage even at small local events and attend networking events and conferences. Again, some of you are going to think, “Ugh!” But who said building a business is easy? If you think it’s tough and don’t want to do it, then, yeah. We’ll wait. We’ll wait if you don’t mind if you can just leave by the exit over there. Or if you want to build your business and you want to do the work now so that in the future, it becomes really, really easy. That’s what it’s all about, doing the work now to make a perpetual sales cycle. It’s all got to start somewhere. So, attend those events. Get to know people. You will find that you’ll build relationships. Amazingly, once you get to know people who do what you do as well, you’ll suddenly start to not think of them as competitors but you’ll find someone so that when you’re on holiday or when you’re ill or sick, you can say, “I can’t take on–“. Of if you’re busy by the way, you would say, “I can’t take on your work at the moment but let me give you a number of someone who can.” You pass on to your mate. He or she does vice versa. It’s a wonderful thing when she gets friends and relationships in your industry. #6: Dress appropriately when in public You may want to be a lazy whatever. You may want to wear shorts, scruffy T-shirts and so on. In fact, I go to internet marketing events and a lot of people dress down because they think– If they’ve got the theory of you can do internet marketing while sitting at home in your pajamas, nobody knows. And then they think, “That’s the way to carry it across.” However, I see some of these people on stage. They look scruffy. They might be wonderful but the people– They didn’t have to wear a shirt and a tie and a suit but dress appropriately. There is a standard. If you dress well or well enough, people form an opinion of you. People will have more respect. So dress appropriately likely so that does not mean a tie. You’ll never see me in a tie other than probably a funeral. And hopefully, we’re not going to meet at a funeral anytime soon. It’s not necessary. But I could just wear scruffy T-shirts but then generally, I do, but not in public. But for work, I think I dress appropriately. So do that. Just think of everything. This is all branding. This is all how people perceive you. This is what it’s about, remember? This is not just about, “Are we blind? He’s telling us all to get dressed now.” This is about how to build your personal brand. Remember, your brand is how you want people to think of you. If you want people to think you’re scruffy, by all means, wear a shorts and a T-shirt to meetings then that’s what they’ll think. However, if you want people to think you’re efficient, good in business and serious about it then dress appropriately. Okay? Simple as an annoying advert says, I think, in the UK. That’s it. That’s all I’ve got. I think you can work on those. It shouldn’t be too tough over the weekend but certainly think about it. What about other people in your staff who meet with your public sales people, delivery drivers, etc, receptionists, etc? Just think about that. Make sure that once you decide on the message branding, make sure your other staff are aware of it and buy in. Explain to them why and then explain to them how you came about the ideas. Possibly, talk it over with them as well. Get them involved. Get a bit more buying and then make sure they stick with it as well. Very easy. Anyway, that’s it. You’ve heard enough from me. Go have yourself a wonderful weekend and I will see you on Monday.